This prestigious award, named after one of the most renowned opera artists of the 20th century, is given to a single performer each season in recognition of a particularly memorable and outstanding company debut. The winner was announced earlier at the annual Dallas Opera Board and Trustee Appreciation Dinner held in the Crescent Ballroom of the Hotel Crescent Court in Dallas. The National Winner of the 1998 Metropolitan Opera National Council Auditions is an alumnus of the University of Iowa and Indiana University, who served for six years in the Army National Guard. 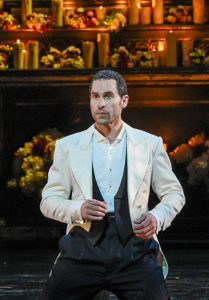 Today, Ketelsen is renowned throughout the opera world for his powerful, sensitive bass-baritone, his extraordinary stage presence and his show-stopping skills as an actor.